Although the idea of Nicole Kidman showing up for a bucket of Shiner Bock and some karaoke at Fantastic Fest is, frankly, rather absurd, the festival has been good to Karyn Kusama. In 2015, Fantastic Fest was one of a handful of festival dates for Kusama’s film The Invitation, and the Alamo’s (now dormant) Drafthouse Films label picked it up for worldwide distribution. That film marked Kusama’s return from so-called “director jail” after Æon Flux (2005) and Jennifer’s Body (2009) flopped at the box office—an institution whose sentences for women are consistently longer than they are for men—and paved the way for Destroyer (Grade: B), which seals the director’s place as one of Hollywood’s top craftspeople. The plot of Destroyer, which stars Kidman as Erin Bell, an LAPD detective plunged into her own personal hell after receiving a cryptic message from an ex-associate, is very much in the mold of anti-establishment ‘70s cop movies like Serpico and Dirty Harry. In short, it doesn’t re-invent the rogue-cop wheel. But it’s also far from generic. That’s thanks not only to its high level of directorial craft—the lived-in way Kusama frames Los Angeles’ ethnic enclaves and dusty side streets is particularly evocative—but also a collaboration between actress and director that gives Erin emotional, psychological, and even spiritual depth underneath her gruff, raspy-voiced exterior. Kidman’s physical transformation for the role is a remarkable thing in itself, on the level of Charlize Theron’s portrayal of Aileen Wournos in Monster. Kidman plays Erin both in the present day and 15 years ago, when she was a fresh young police cadet recruited for an undercover investigation into a meth ring led by the diabolically reckless Silas (Toby Kebbell). In her younger incarnation, Erin is basically Nicole Kidman in a heavy brunette wig. But in the present day, Erin is a brittle husk of a woman, whose bloodshot eyes and papery skin betray not only decades of hard living, but a certain spiritual poverty as well. Still scarred by the death of her partner in that long-ago undercover assignment, Erin has learned to cope through those old movie-detective standbys of booze and sudden, intense bursts of violence. But Kusama and Kidman also give Erin’s hard-bitten amorality an intriguing twist by making her, for all her tough talk, ineffective and eternally frustrated. Her 16-year-old daughter Shelby (Jade Pettyjohn) openly despises her. Her colleagues make hurtful jabs at her looks and abilities. And the suspects she interrogates are all sass and backtalk, right up until the moment she starts pounding their faces into jelly. No one takes Erin—or her pain—seriously, which makes her desperate fumbling all the more painful to watch. Prior to a set of heavy emotional beats and startling twists in the third act, Destroyer is surprisingly funny. (Bradley Whitford is a highlight in his brief scene as a sleazy criminal-defense lawyer.) An explosive bank robbery scene midway through is expertly staged and thrilling to watch, and the knife-on-bone score by Theodore Shapiro and ashen cinematography by Julie Kirkwood amp up the grittiness of the piece until you can practically taste the polluted LA air. 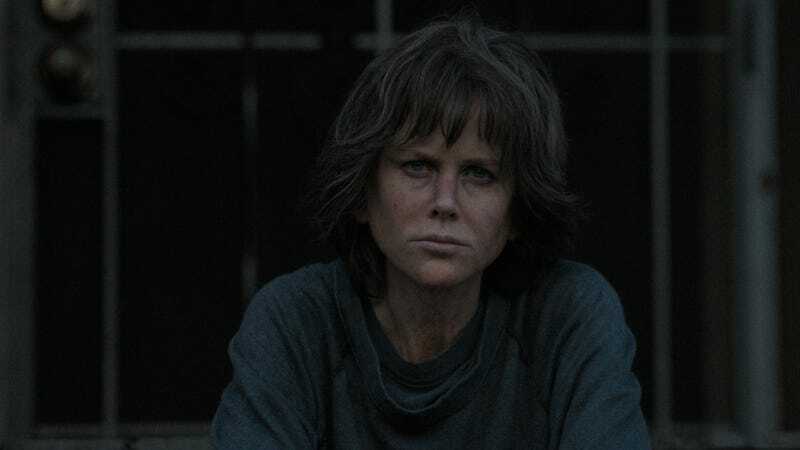 At the center of it all is Kidman, the indisputable heart of the film, whose all-in performance elevates Destroyer above a well-made cop drama and into something special.